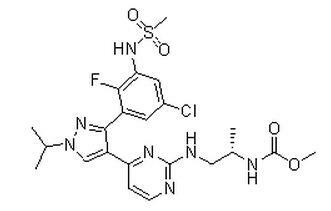 Remarks: Encorafenib, also known as LGX-818, is an orally available Raf kinase inhibitor with potential antineoplastic activity. LGX818 specifically inhibits Raf kinase, a serine/threonine enzyme in the RAF/mitogen-activated protein kinase kinase (MEK)/extracellular signal-related kinase (ERK) signaling pathway. By inhibiting the activation of the RAF/MEK/ERK signaling pathway, the administration of LGX818 may result in a decrease in proliferation of tumor cells. The Raf mutation BRAF V600E is frequently upregulated in a variety of human tumors and results in the constitutive activation of the RAF/MEK/ERK signaling pathway that regulates cellular proliferation and survival. Check for active clinical trials or closed clinical trials using this agent.